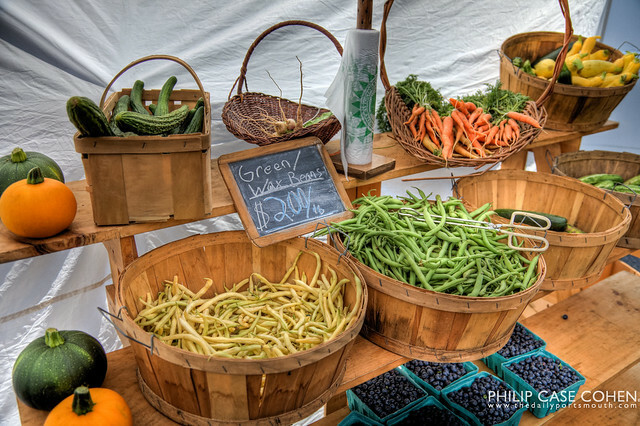 The Portsmouth Farmer’s Market is a great destination on a hot Saturday morning in the heart of the summer season. We visited and strolled around, picking some great veggies for a Sunday BBQ out on the grill (a very hot one…)…had some great lemonade and tried some delicious maple syrup from Sugarmomma’s Maple Farm. I’d never heard of a hot maple syrup, nevermind actually tasting one, so when I had the chance to sample – I was pleasantly surprised and even used it as a marinade on some chicken for the bbq. Delicious indeed. I love this shot of all the rich wood colors and the natural goodness of the veggies….and I’m happy we took the time out of a busy Saturday to stop over.